The Annual Juried University of Wyoming Student Exhibition is a highlight of the Art Museum’s exhibitions, not only for those who participate, but also for the UW campus and the visiting public. The exhibition is open to any student at UW enrolled in the 2014 academic year. Past entrants have been from such diverse degree programs as computer science, engineering, ecology, and art. Students may submit artwork in any medium, including photography, painting, graphic design, and sculpture. A variety of cash and purchase awards are given each year to exemplary works and will be announced at the awards ceremony. 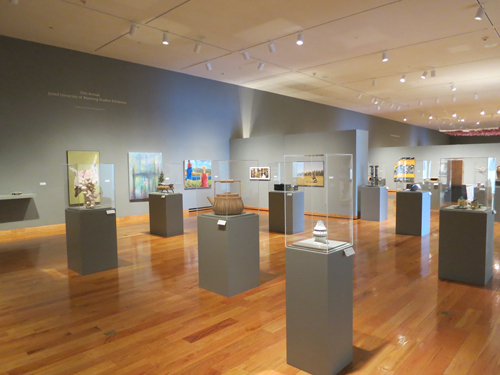 At the close of the exhibition, a selection of works will continue to be on view in the Centennial Complex Gallery through March 29. In addition, the online process enables the Art Museum to work with jurors who are in more distant locations than previously. The juror for the exhibition this year is Nina Johnson-Lilewski, director and owner of Gallery Diet in Miami, FL. Image: Student artwork is on display in the Art Museum during the Annual Juried UW Student Exhibition.